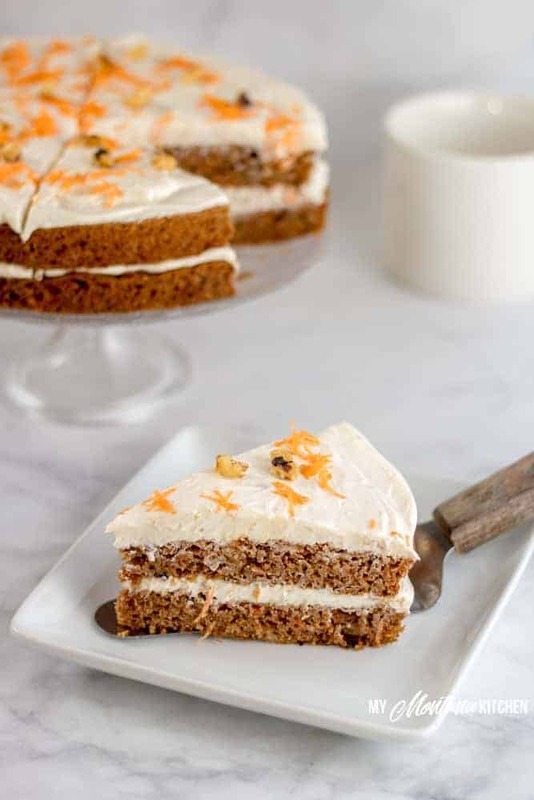 Sweet and dense cake filled with carrots, spices and nuts, and topped with a creamy cinnamon cream cheese frosting. 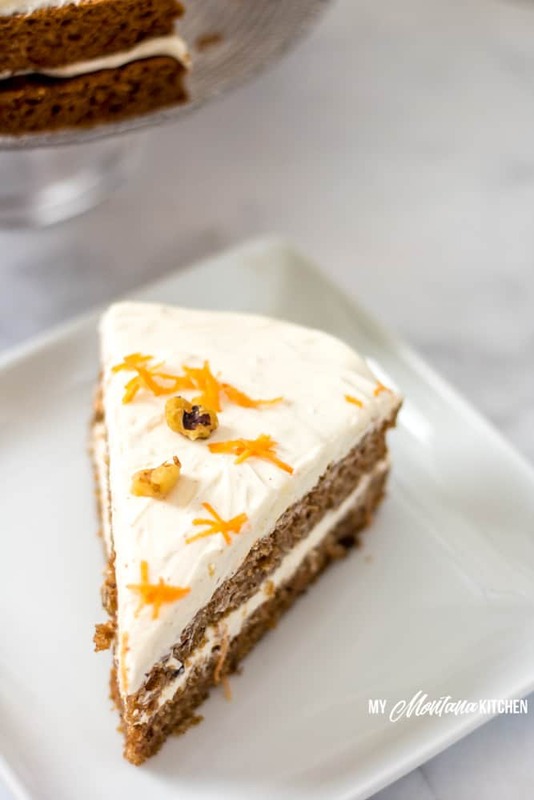 This Sugar Free Carrot Cake is everything you’ve ever dreamed of in a low carb carrot cake recipe! 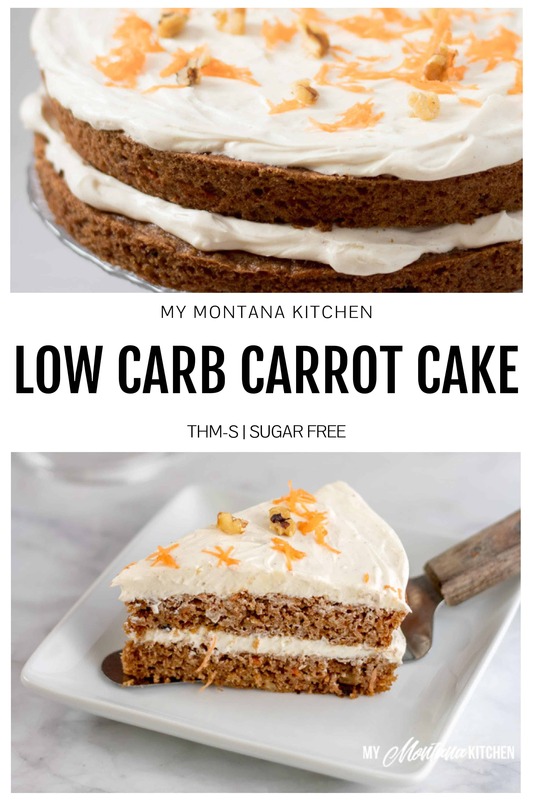 Is it possible to make a low carb keto carrot cake? Absolutely! All you need are a few different ingredients, a little ingenuity, and a bit of time! Fortunately for you, I’ve already done all of the work – so all you need to do now is make it yourself! I promise, you won’t regret it! The first step is to gather your ingredients. I always find my recipes go much smoother and quicker when I have gathered all the ingredients before-hand. I chose to use Trim Healthy Mama Baking Blend in this recipe, but if you do not have the Baking Blend, you have two options. Make your own using this great recipe! This recipe also calls for Gentle Sweet, a powdered sweetener made with xylitol, erythritol, and stevia. But again, if you do not have it, you can easily make your own low carb powdered sugar! Or you can use Pyure (available at most Walmarts and Grocery stores), but be sure to cut the amount of sweetener used in half, as it is about twice as sweet as Gentle Sweet. Since there is no butter to cream in this recipe, I begin by mixing the dry ingredients first. The Baking Blend, cinnamon, baking soda, baking powder, salt, and Gentle Sweet are all combined in a large bowl. Cut out a circle of parchment paper that fits evenly into the bottom of your cake pan, and spray the sides of the pan well with coconut oil spray. Then simply pour the cake batter into two 8 inch round cake pans, and bake! I would tend to agree with her – the frosting really makes the cake! I chose to add just a touch of cinnamon to this cream cheese frosting, and it really adds something extra special! It is important when using cream cheese in a frosting that you allow the cream cheese to set out long enough to fully come to room temperature. I have often tried to speed up the process by microwaving the cream cheese, but that generally leads to lumpy frosting (bad idea)! The key here is to have patience. If you know you are going to be baking the cake later in the day, set out your cream cheese several hours in advance so it has time to fully come to room temperature! I chose not to frost the sides of the carrot cake, but you certainly can if you prefer. You could even make a little extra carrot cake frosting, and pipe some pretty flowers on the top! Are Carrots High in Carbs? The truth is that carrots are higher in carbs than other low carb vegetables, but with only 4 net carbs for one medium carrot, they can be enjoyed in moderation. If you are a Trim Healthy Mama, the amount of carrots in this cake still fits well within the THM-S category! 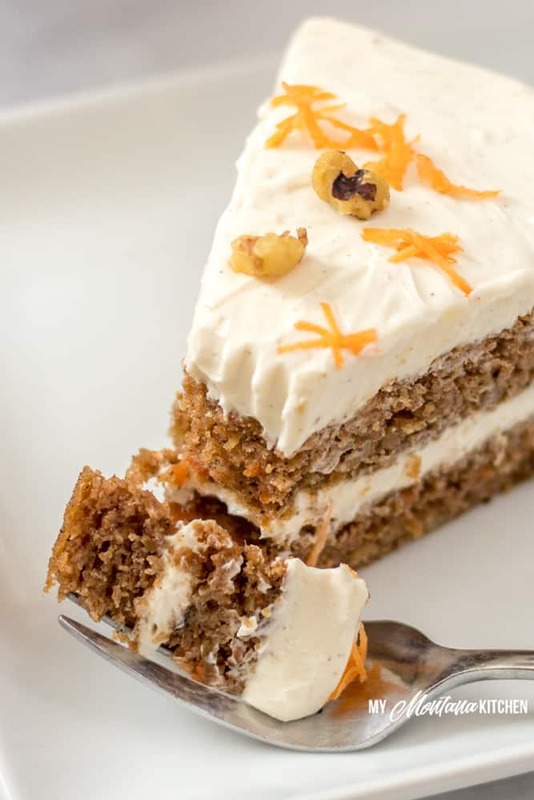 This healthy carrot cake recipe only calls for 1 cup of grated carrots, which only contains 8 grams of net carbs. Spread out over the 12 servings of cake, you can see that it does not equal very many carbs per serving. Add melted coconut oil, vanilla, eggs, hot water and carrots and mix well. Cut a circle of parchment paper to place in the bottom of each 8" circle cake pan, then spray the sides of the pan with coconut oil spray. Divide batter between 2 8" round cake pans (it may be thick). Bake in preheated oven for 23-25 minutes, or until center top of cake is dry. Spread half the frosting onto top of one of the round cakes. Place the second cake on top and add remaining frosting to the top of that cake. If you do not have the THM Baking Blend, you can use an equal mix of almond flour, coconut flour, and flax meal. If you do not have Gentle Sweet, you can use my Low Carb Powdered Sugar in equal amounts, or use Pyure and cut the measurement in half. Can this be made in a 9 x 13 instead and just ice the top of it? Sarah, where do i go to see the comments others have made. I never see any of them when I open your emails. I don’t want to ask the same questions that you may have already answered. Was so good and so moist and roasted just like regular cake love it will make it again! Perfect in time for Easter! Plus I love that this cake is refined sugar free! Could this recipe work for cupcakes as well? Been wanting to try my hands at low carb cakes for a while. I have only tried one chocolate paleo cake and was not too impressed, so I want to try again. 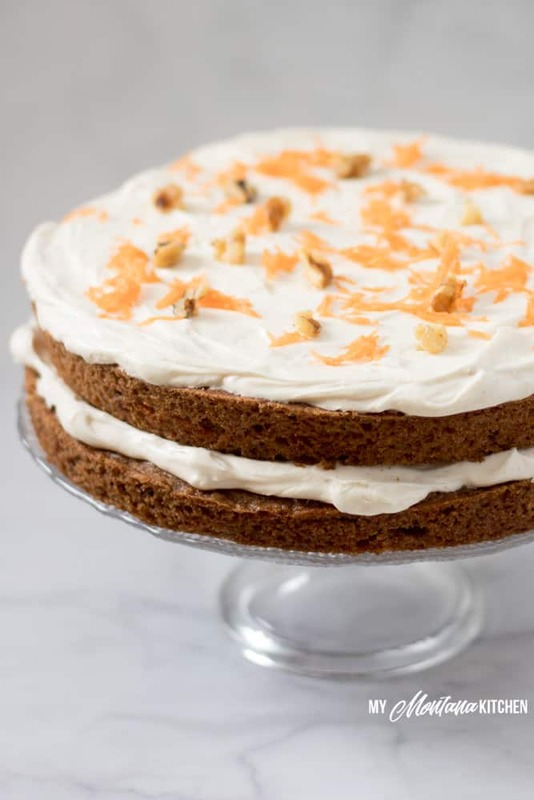 Carrot cake sounds right up my alley, thanks for the inspiration! How long did you bake the cupcakes?? I just made them as cupcakes this weekend and I baked them for about 18 minutes. Is this one that is best after chilling? I assume it needs to be stored in the fridge. Yes, it should be stored in the fridge. I think it is great right away, but some may prefer it refrigerated. Could this be made like a sheet cake? I think you could make it in a 9×13, but I haven’t tried that yet myself, so I’m not sure how thick it would be. This is hands down the best THM approved dessert I have EVER made. Thank you so much. I don’t have 8 inch round cake pans. Can I bake it in a regular 9 x 13 pan? Yes, I would think so, but I have not personally tried it with that method, so I cannot be sure if it will be the right thickness.